GreenBeanTeenQueen: Bloggers and Librarians-Can't We All Just Get Along? Bloggers and Librarians-Can't We All Just Get Along? So after sitting in on a panel discussion on blogs and hearing some murmurs about bloggers at ALA, I've been thinking about librarians and bloggers. As someone who is a librarian and also a book blogger, I feel like I have a good sense of both worlds. I was reading book blogs (and book review sites like TeensReadToo.com and TeenReads.com) before I started reviewing. But posting my reviews on a blog was an easy way to keep track of books I read throughout the year. This was amazingly helpful when I was trying to come up with great titles to booktalk for my summer reading school visits. But not all librarians blog, so how can bloggers embrace librarians and vise versa? How can we work together? For Librarians-Reading book blogs and book review sites can be an incredible resource for reader's advisory and collection management. Yes, we have review journals like VOYA and School Library Journal, but VOYA comes out bimonthly, and there are so many people at my library who see SLJ before it even makes it way to my office, if it ever makes it at all. I love that with book blogs I can instantly see what people are wanting to read and what they've thought about it. If I see a book pop up on multiple blogs, I'm going to take notice and make a note to look into ordering it. I know through blogs when there's buzz happening about a book that's not just library buzz but reader buzz. Book blogs are run by book lovers of all ages-some are teens themselves. Yes, I have a group of teen library council members that keep me informed about books, but these teens also rely on me to keep them informed about new books to read. Reading about what other teens out there are reading and looking forward expands my local library council into a large group of book lovers and I know I'm going to be ordering books that will reach beyond my council members. As much as I'd love to, I can't read every YA book that's published throughout the year. Thanks to book blogs I've found out about books I hadn't yet seen in my bookish wanderings. I'm able to give suggestions for read alikes or books teens might be interested in reading because I've read reviews on blogs. Because of book blogs, I was able to make sure our collection department ordered ten copies of The Hunger Games before we started getting requests for it because I knew it was going to be huge. I don't think book blogs will replace professional journals and reviews, but they are a wonderful addition to those resources. I think some librarians feel like they should be the only ones recommending books or who know about books (I have this same difficulty when trying to break into school libraries as a public librarian sometimes) but book bloggers are not trying to take over for teen librarians. Book bloggers are book lovers just like you. Teen librarians will always be invaluable. But teens are getting information from books from all sorts of places and if they see a book online or visited an author's website and then come to the library asking for that book, as a teen librarian, it's our job to know what it is. And book blogs can help us be in the know. For Bloggers: Yes, I know many of you get books in the mail to review. But don't forget about your local library. I hope you visit the library and make use of their resources. Does your local teen or children's librarian know you have a book blog? If not, make sure you let them know. There is nothing better than working at a library and meeting other people who enjoy reading yong adult literature and are eager to talk books. Librarians love talking books! (What do you think we did at ALA for four days?) Your librarian would love to give you suggestions and I'm sure is eager to hear yours. Read a great book that you think other YA readers would love? Don't just blog about it, tell your librarian about it. Make sure they order it for their collection if possible. Have connections with authors? Librarians would love to connect with authors and you can be that gateway. Have you hosted an online chat with other YA readers or authors? Tell your librarian about it-maybe it can become a teen program at your library where local teens can have an online chat with a new author. Maybe you can even help your library set up a blog. And what about all those review copies you now have and don't know what to do with? What about loaning them out to your teen librarian so they can read it and booktalk it? Don't make blogging a solitary act. Get to know your local librarian and help each other out. I think bloggers and librarians can work together in getting books out there and in the hands of readers. We all share a love of books and I think instead of working separately we can combine our resources and reach a larger audience. What else should bloggers and librarians know about each other? What else can we do to help each other? I'm eager to hear your thoughts!! I love the library and borrow books at least once a week. I've been trying to cut back a little since my TBR pile at home is huge. Our library is so small I'm not even sure if we have a specific YA librarian which is a bummer. I would love to develop a relationship with one. I submit book purchase requests through the website but I have no clue if those are even looked at and how they determine if the book should be purchased or not. Our library does have a blog but it's mostly to post about upcoming events like children's story time. I wish they would post more book reviews. My library is definitely NOT interested in what teens have to say. Or really anyone. I think that my library may have some of the most unfriendly librarians ever. There are a couple that work with children more and are nicer, but for the most part I think their attitudes turn people off to our library. It's really a shame. Luckily, I am not fazed by grumpy (and sometimes downright mean) people - so I am there often checking and rechecking for new books. Luckily, there are libraries in the area that will share books and that do have bigger, more updated YA collections. As for bloggers and librarians... I don't know. I think that in many ways they aren't much different, they both love books. And I think its great that bloggers have the chance to go to those kinds of event. I mean, librarians would be sore if there was a blogger event they were prohibited from. Plus, in the bigger scheme of things, bloggers and librarians are both important when promoting a book - so neither should be left out. My college town library is quite small, but a nearby town has a FANTASTIC YA selection: I swear that whenever I request a book, it almost always comes from that library. That being said, I do want to help my local library with their book selections, but am afraid of sounding too petulant that I know what they should be spending their VERY limited budget on. If you were a librarian working in a small library with a limited budget and YA section, how would you deal with someone like me? How should I go about letting them know that I'd like to help expand their YA selection? Great post! I've only been blogging for a year but I have found such valuable insight and great books through other bloggers. And I am at my library at least once a week. We live in a small town but our library is a local gem in a beautiful building with carved woodwork, tall windows, comfy chairs and wooden tables. The librarians weren't always friendly but the group that is there now is extremely helpful and very nice. A young man runs it now and he is very knowledgeable and spend a lot of time researching grants and finding other ways to make improvements to the library. The auditorium has been renovated in the original style and is once again in use for a variety of programs. There are other amazing areas as well. The children's section is run by a nice woman who also does a great job. She is always looking for ways to improve and keep up with what the public wants. She isn't very familiar with blogging and I have shared some information and I gave her your email address a few months ago. I'm not sure if she ever contacted you, I'll have to follow up on that. She was thrilled to hear about some of the resources I gave her but I told her you would be a good source for so much more. I love libraries! They are the best resources ever. Although, the head librarian doesn't like me (I was friends with her daughter in elementary school, after we weren't friends her mother would give me unreasonable fines... like a book was a week late and she'd charge me for it as missing). As a YA librarian and a blogger I love both words :) I've learned about books that I have missed in VOYA or other mags. I also find it interesting to read teen blogs to see what they like. I do know some librarians who are anti blog. And some who just don't have the time or do not want to do it. I personally think they are missing out on great opportunities. Part of the reason behind my SLJ article (Curl Up with a Cup of Tea & A Good Blog, from 2/2007, available online) from a few years ago was to let librarians know what blogs are, and aren't. The good & the bad about blogs is everyone can have one; anyone can be a blogger. And for some librarians, it's not so much anti-blogs as just not seeing any value to them. And given that it can be hard to find the "good" ones (good = one that fits the readers interest), I can understand why someone doesn't jump in. Frankly, when I read a book blogger complain how Australians cannot win a Printz, I know it's an individual blogger issue, not a "all bloggers" issue; to the non-blogger, tho, who sees it, it shows that while that blog may be a book lover it's not by someone who has the type of broader, deeper knowledge the librarian expects. Bloggers who complain about GLBT literature? Again, to a non-blogger, that becomes representative of the blogosphere as a whole. For bloggers, I wonder: how many read (a lot online, for free!) Library Journal, School Library Journal, Horn Book, Booklist, etc. to know what it is that librarians are concerned about and thinking about. Also, anyone can join YALSA. It's not just for librarians. Anyone can join and get involved. Finally -- my plug for the kidlitosphere conference in DC in October, which does include tween/teen and always has. And includes librarians who blog. Like me. Great post first off! I actually never had to purchase for my library, so I never looked into book blogs, but I think it would be a great resource to look at. I know that's where I get a lot of my personal reading material from lately. The library is my budget lifesaver! I don't know how I would read if I didn't have awesome ones in Illinois! My friend is moving to Washington and had also worked at a public library with me... what was her main concern when planning to move? Libraries.. she's not sure it'll be as good as Illinois and our reciprocal borrowing privileges - which basically means in IL you can take your one library card and hop over to whatever library you feel like and use their library - as long as it's in IL. It's really great when you move temporarily or work closer to one library than your home library. :) I just love IL. Since ALA I've been thinking about how librarians/book bloggers could work together..bridge that gap so to speak. I've no ideas, but I'm more than willing to explore the possibility. I would love to see a panel discussion/sessions about this next year at conference. One that didn't require a full-registration to go to. Maybe we can all pool together (both librarians and bloggers) and make something happen. Or, if someone hasn't already done their YALSA evaluation (I have already), add it on! Some things to do right now though, for both groups. 2. Read up on blogging. Poke around the blog community. Lurk! And then, if you don't like it, leave it be. If you do like it, join on in. But at least know about blogging. 3. Be more open-minded. Bloggers aren't trying to replace librarians. They are just book lovers, trying to get more people to read and love books. 1. Know your local librarian. This will help you if you want to suggest titles. (I take suggestions from patrons I know use the library more seriously than patrons just passing through.) It can also help in getting a heads-up about new books coming to the library, or ways for collaboration. 3. Be more open-minded. Not all librarians dislike you -- I was thrilled to see bloggers at ALA. We're also just book lovers, trying to get teens hooked on books. Well, that was the longest comment ever. I'll be checking back on this post -- this conversation is very important to me, coming from both camps! I am a librarian in a small town library, my predecessor started the YA section and I have continued to add to it so much so that my YA circulation is only about 100 books less than my adult fiction.I rely on the blogs because I sure can't afford Library Journal. Steph Su I would welcome your input I'll take anyones recommendation at my library. 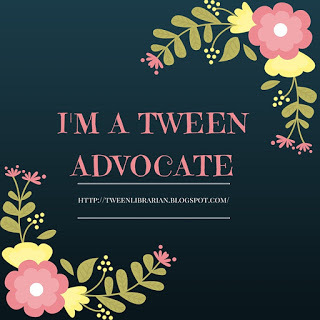 I am a new blogger also on my blog are reviews from my Teen Advisory Board. Off topic but library related - I tried to donate good quality books to my local libraries a while back but most were unable to take them. I eventually found one where a staff member said they would take them, then when I turned up the desk staff look at me aghast and almost gave them back. Eventually someone said they could take them but they mgiht end up scattered around the borough (no problem). I didn't get a thanks and I sort of wish I'd taken them away with me now. Why don't libraries take good quality, read once books anymore? I'm a YA Librarian and a blogger! I think blogs/blogging is such a great supplement to library journals. It really helps me connect with what teens are ACTUALLY reading- plus the YA Lit/Book blog community is so welcoming and cool. I know some bloggers come into my library- but I would LOVE for high school book bloggers to introduce themselves to me. Just reading through the comments, it is such a shame that ALL libraries don't have teen supporters. It's really awful and not good for both public service and gaining life-long patrons. I'm also a librarian and book blogger, and this is a really excellent post. It's interesting sitting on the fence as we do and hearing what bloggers and librarians think of each other; I hope that both groups can work together. Jodie-- accepting and cataloging donated books can be a logistical nightmare for larger libraries. Our library system has more books than they can store and is continually weeding to make room for new books. It is frustrating, though--I had to buy 2 new YA books that my library didn't order and I'd love to donate them if I could. I'm both a blogger and a library director. As a director, I would want to know if my staff was being unresponsive, my collection was lacking, etc. Of course, if your libraries are being reduced to 4 days a week, they may not have the funding to get the books you think they should have. But attitude is free. There is no reason that they can't be positive and professional about your requests. Just understand that libraries are under intense budget pressures this year and may agree that they want to have the books you are asking for but just don't have the funds to make that happen. I also have seen at conventions/workshops the attitudes towards teen's that other librarians have and it makes me wonder if I'm just lucky.I have the greatest teen patrons they are big readers.I also agree that a librarian has to read alot of different books thats why I always have 2-4 books going at the same time.I listen to alot on audio while reading others.I have to be able to recommend books of all genres because I am the only librarian in my small town.This is a great topic! Order Cialis, Viagra, Levitra, Tamiflu. Get Cheap Drugs online. Buy Pills Central. Our polished underpinning together of steep practised pharmacists will staff you cheap Cialis Online, consulting on varied constitution questions. As a replacement for many years Buy Viagra Diminish Dispensary has been recognizable all of a add up to unequalled online drugstore suppliers and customers all over discount Cialis now the world.